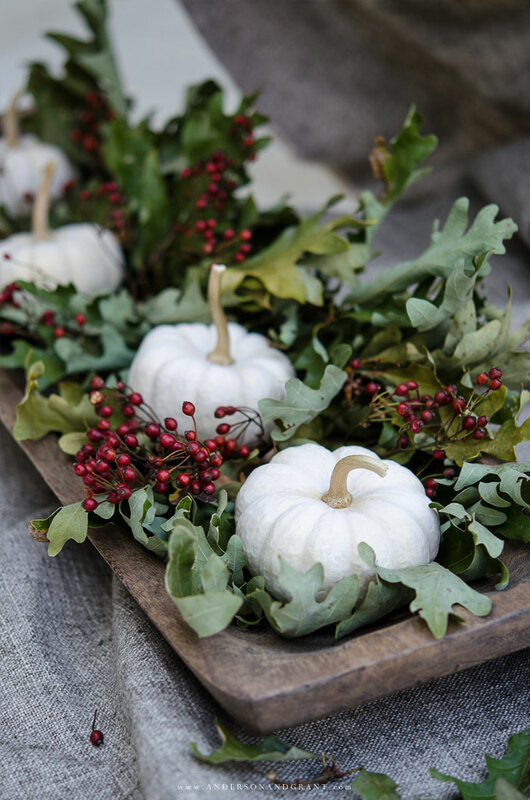 Creating a memorable display to stretch across the center of your table is most fun when you mix and match items from around your home that will compliment your place settings. You can really think outside the box and use pieces that you love even if they aren't traditional centerpiece decor. And by shopping your home, this project is pretty much cost free. 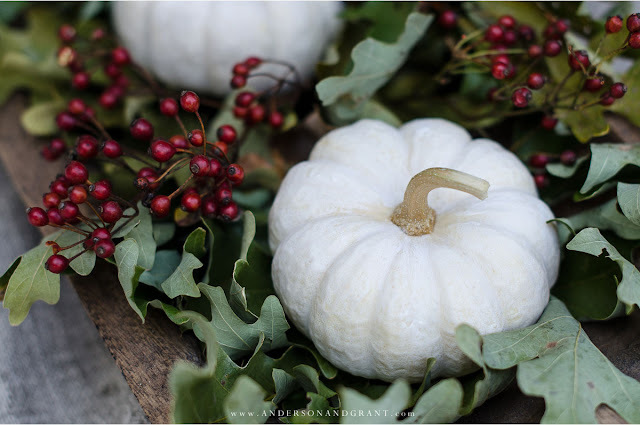 In the case of today's post, I took a trip outside to gather pieces of nature that I find to be beautiful in the fall rather than using things that have been purchased at the store. Putting this together took no time at all and is so simple and mistake-proof that anyone can do it. I'm going to share just a few guidelines to help you create something similar, yet in your own style with what you have available. 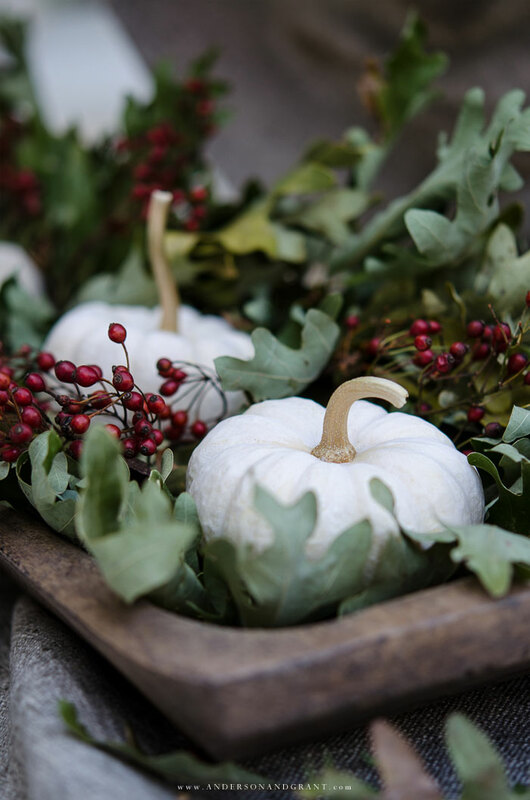 One important tip to remember when creating any centerpiece is that it should be built on something that can be removed easily from the table. If you need to make more room for food or an impromptu craft project, you don't want to have to disassemble everything you've worked hard to create piece by piece. 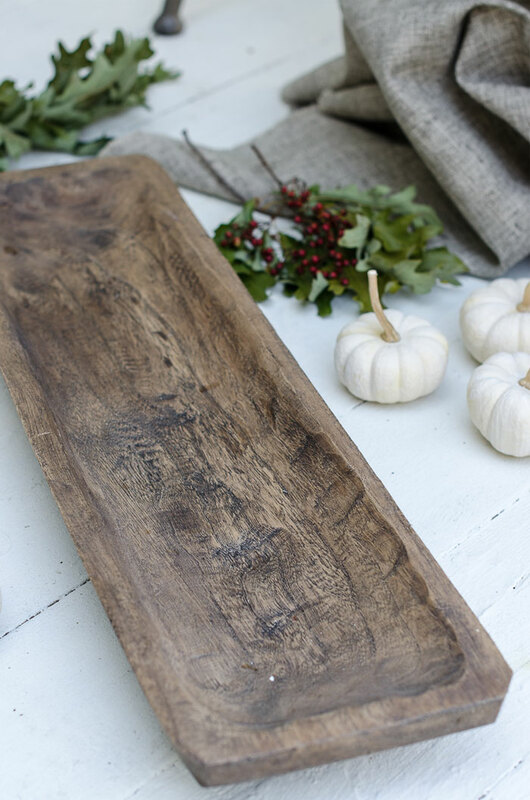 I used a long wood dough bowl to hold my entire centerpiece here, but you could also build yours on things like a tray, cutting board, or rustic plank of wood. Green oak leaves that I gathered from outside and dried form the first layer of elements in my centerpiece display. I love the light green shade that these leave turn to as they dry and curl. And the scent they have is pure autumn. Any cuttings from trees or bushes will do here, and you can even use faux leaves if the real variety is no longer available. You can also buy preserved leaves online. 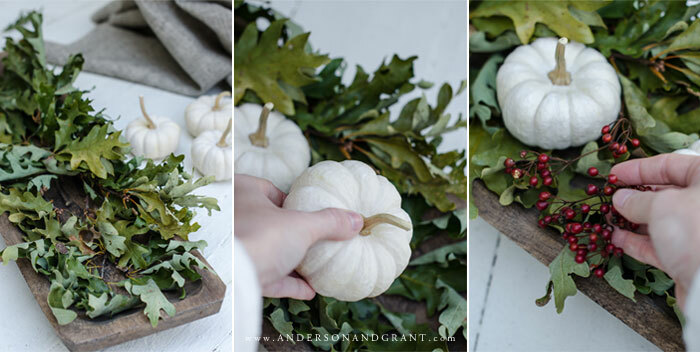 Next, small white pumpkins (called baby boos) are gently placed on top of the preserved leaves. 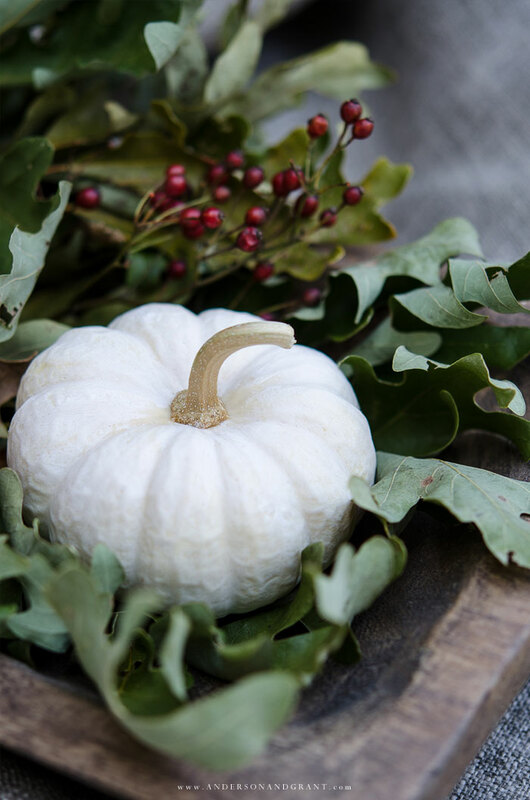 There is nothing fancy about this centerpiece, so the pumpkins do not have to be perfectly placed, evenly spaced, or lined up. Because they are resting on uneven branches, they are going to want to tip and that is fine. Just tuck them into the leaves wherever you think they look best. 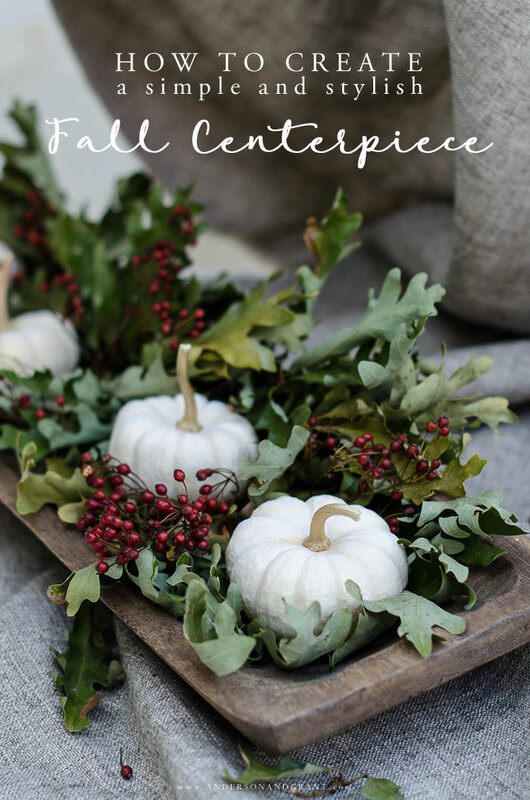 Feel free to also use gourds or faux pumpkins here. Berries cut from a bush in the woods are the final accent to tuck in my display. While a few berries were lost while putting this together, they dry nicely in the arrangement and remain intact on the stems. Again, a faux version will give you a similar look. 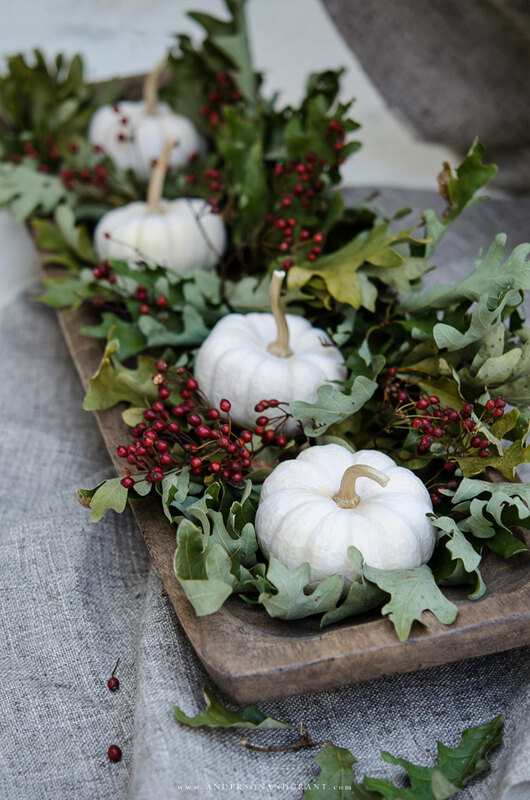 You could also sprinkle some acorns throughout the display for something different. Although I didn't do it here, adding candlesticks and taper candles into the bowl would be a nice final touch and add a little shine at the dinner table. 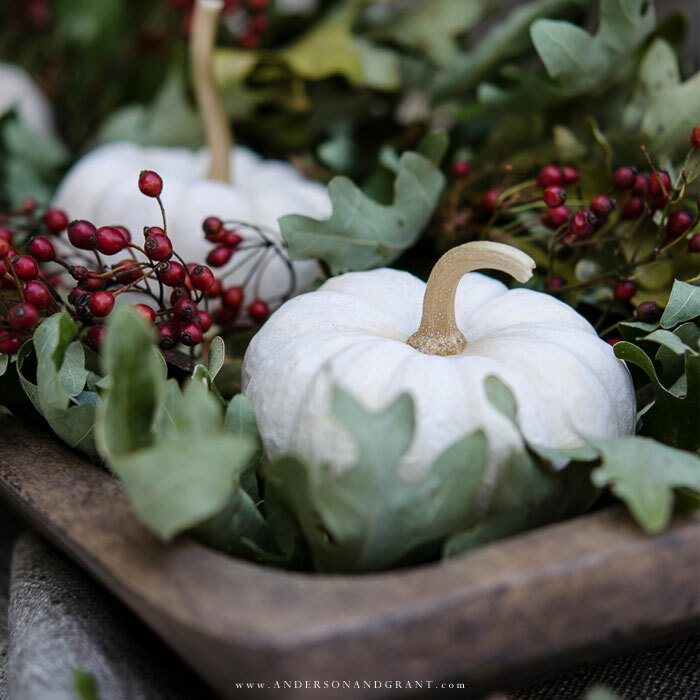 The goal here really is to use what you already have or available around you to create something festive to highlight the center of your table. There is no going wrong. This one turned out to be a bit of an unconventional color pallet for fall, but I love that it is unique. And whatever you choose to put together for your table will be just as special. I'd love to see what you create after reading this post, so feel free to send me an email or tag me on Facebook or Instagram.